Every refugee has a specific experience in reacting to the pressures forcing them to leave their homeland. This blog documents the experiences and subsequent history of people and families forced to leave Ireland in the nineteenth century and who ended up in one particular English town. Politicians today would do well to remember that today’s ‘refugees’, ‘asylum seekers’ or ‘economic migrants’ are human beings who are following in the historic paths trodden by millions before them. Grim as the Irish experience in Britain and the New World often was in the nineteenth century, the treatment of many migrants today is arguably worse. For Engels’s ‘Little Ireland’ in 1840s Manchester, read ‘the Jungle’ in Calais today. This post looks at some very ordinary Irish people who, from modest beginnings, formed a nuclear family whose descendants fanned out into the host society. They were not forced out of Ireland during the Famine itself but were amongst the waves of people who saw no future in the country in the succeeding decades. The Caulfield family initially lived elsewhere in England before finally settling in Stafford. They became a family that aspired to respectability despite apparently humble origins and were the sort of people who began to appear at the soirées I described in my last post. The surname Caulfield can either be an Anglicisation of the Irish MacCathmhaoil or be derived from a 17th century English planter family. It is relatively common in Cos Mayo, Galway and Roscommon, the classic area of Stafford’s Irish immigrants, and Francis William Caulfield was indeed from Co. Galway and had been born there around 1846 at the height of the Famine. He seems to have come to England as a young man in the 1860s and worked as a gardener in Chester, a city which at that time had many market gardens in the surrounding area. We know he was there in 1868 because in that year he married Ann Sanders who had been born in Co. Mayo in the late 1830s. In 1871/2 they were living in Hoole, an outer suburb of Chester, with their three young children, although their baby Mary Ann died early in 1871 when she was only about three months old. Between 1872 and 1874 the Caulfields left Chester and moved down the main railway line to the Tamworth area in Staffordshire where their daughter Annie was born in the latter year. We know they finally settled in Stafford town in the next four years because poor Annie died in the town in the autumn of 1878. The surviving Caulfield family therefore consisted just of Francis and Ann and their two sons Simon (b. 1869) and Francis Patrick (b. 1872). The family was Catholic. Francis Caulfield probably moved to Stafford to get a better job because in 1881 he was described as a nursery foreman and the family was living in the respectable locality of New Garden Street. By 1891 they had moved to the equally respectable Telegraph Street in Forebridge. As befitted their status, Ann Caulfield was recorded at St Patrick’s soirée in 1896. By 1901 Francis’s fortunes had declined, however. He had reverted to being a ‘gardener’ and as aging 60-year olds the couple were living in more straitened circumstances in the far-from–salubrious Cherry Street. Their two sons had left home in the 1890s. Francis and Ann ultimately ended up in a miserable cottage in Tenterbanks, and in 1911 Francis was making a bit of money as a ‘jobbing gardener’. They lived to a good age, however, because Ann died in 1918 aged around 81 and Francis in 1922 when he was 76. Francis and Ann Caulfield were, therefore, rather late in-migrants to Stafford. Although their circumstances were modest, they were clearly a hard-working and aspirant family. Their son Simon achieved a sound education and began work as a clerk in White and Westhead’s accountancy firm. In 1896 he married Emily Julia Deavall, the daughter of Thomas and Elizabeth Deavall, a local Stafford Catholic family. He must have been a diligent worker and in 1899 he was appointed chief clerk and cashier to the Stafford Borough Gas and Electricity Department. He worked there for the rest of his career. He was a respected local government officer and took a fairly prominent role in social and professional activities related to his work, as well as being active in the social life of St Patrick’s Church. The couple lived at a respectable address in the north end, 86 Victoria Terrace, and they stayed there for the rest of their lives. They had eight children, five boys and three girls, and they have many descendants today living in the Midlands and elsewhere in Britain. Stafford gas and electricity works in 1926 where Simon Caulfield worked as clerk and cashier. The works were a polluting eyesore in Stafford town centre for well over 100 years. Ann and Francis Caulfield’s son Francis Patrick went into Stafford’s traditional trade and became a shoemaker. Like many shoemakers he moved around in search of work, and in 1893 he must have been in the shoe town of Leicester because he married Minnie May Williams there. She had been born in Chester in 1871 but the Williams family had moved to Stafford around 1872, the same time as Francis and Ann Caulfield. The two couples must have known each other in Chester. By 1901 Francis and Minnie had set up house at 43 North Castle Street and they went on to have at least nine children. Although most were born in Stafford, Gertrude was born in Manchester (1900) and Walter Francis in Leicester (1907), so this branch of the Caulfield family continued to move about in search of work. Walter Francis himself emigrated to Australia in the 1920s, and there are extensive descendants of this branch of the family in Australia today. The Caulfields were a respectable and aspirant Irish Catholic family who did reasonably well in Stafford. Although the original in-migrants Francis and Ann lived in modest circumstances and seem to have been poorer in later life, they attracted no trouble and took some part in Catholic social activities. Their son Simon did well and reached a respected middle-ranking position in the local authority. Francis was less prominent and perhaps made the wrong choice in going into the shoe trade when it was already past its peak. Overall, however, the Caulfields are an example of an Irish Catholic family and their descendants who integrated fairly seamlessly into life in Britain. Marriage, Great Boughton Registration District (RD), January-March 1868, 8a/477, Francis Caulfield and Ann Sanders. Birth, Chester RD, October-December 1870, 8a/349, Mary Ann Caulfield; death January-March 1871, 8a/266. Birth, Tamworth RD, October-December 1874, 6b/435, Annie Caulfield. Staffordshire Advertiser (SA)¸28 November 1896. Deaths, Stafford RD, September 1918, 6b/21, Ann Caulfield and March 1922, 6b/34, Francis William Caulfield. Marriages, Stafford RD, April-June 1896 6b/42, Simon Caulfield and Emily Julia Deavall. SA, 13 February 1904; 10 December 1910; 11 January 1913; 5 May 1917, 2 August 1919, 17 December 1921. Marriages, Leicester RD, July-September 1893, 7a/464, Francis Patrick Caulfield and Minnie Mary Williams. Information from Francis W. Caulfield, Hawks Nest, NSW, Australia, November 2005. My last post (7 December 2015) looked at the problem of ‘leakage’ from the Catholic Church by the Irish and their descendants in late-Victorian Stafford. Working class families in Stafford’s north end were particularly likely to ‘leak’ and the opening of St Patrick’s School in the area in 1868 had by no means solved the problem. The Church needed more of a presence in the Foregate to retain the working class Catholics for whom St Austin’s was too far away in both distance and in the social exclusiveness of its English elite. In 1884 a newly-ordained priest, Fr. James O’Hanlon, was appointed curate at St Austin’s with special responsibility for the north end Catholics. O’Hanlon was of Irish descent, though he had been born in Scotland, but he made only modest and ‘safe’ gestures towards Irishness in this ethnically-mixed Catholic community. He was determined to establish a permanent church in the north end, and a Mass centre was started in 1884 on the first floor of St Patrick’s School. For the next ten years he waged a campaign for a separate church in the area, but Canon Acton at St Austin’s opposed the idea since it would reduce his congregation by 60 per cent and financially undermine his still-indebted church. He also feared the local Catholic population was too poor to support a new mission, but he had to balance this fear with the on-going threat that north end Catholics might be lost to the Church altogether. He finally agreed to back the proposal in the early 1890s, and on Christmas morning 1893 the new mission opened to serve an estimated 700 Catholics, of whom about half were Irish or Irish-related. Initially Masses continued to be held in the school building but in 1895 a ‘temporary’ pre-fabricated building was erected adjacent to the school. The ‘iron church’ was to continue in use for 35 years. Although St Patrick’s was usually seen as serving Stafford’s poorer north end, there was in fact little difference in the social status of Irish and Irish-related Catholics in the two missions. In 1901 St Austin’s had in fact a slightly greater proportion of unskilled workers, 28 per cent as compared with 24 per cent at St Patrick’s. The big difference between the missions was that St Austin’s retained the patronage of most (though not all) of Stafford’s elite English Catholics. Most of these people lived in the salubrious suburbs in the south end of town. St Patrick’s still needed to tap the financial resources of this group. The foundation of St Patrick’s was a major contribution to the Church’s strategy to retain the adherence of Stafford’s Catholics, but other activities were also significant. The Church tried to evangelise amongst those Catholics who might be negligent. Visiting missions were organised. In 1882 the Jesuits came to St Austin’s and ‘attracted a large congregation …. [but the services] … had little of the character of propagandism, [their] object rather being the quickening of the spiritual life among those who are members of the Roman Catholic community.’ [There are] ‘very few of the Catholics in the town who have not been to their duties since the commencement of the Mission and the results are therefore considered most satisfactory’. Attendance doubtless lapsed again, however, and further missions were reported in 1889 and 1895. The latter mission by two Franciscan fathers to St Patrick’s was ‘to urge more earnest observance of religious duties’ and was ‘well-attended’. The emphasis seems to have been on earnestness rather than enthusiasm. In July 1886 2-300 of St Austin’s parishioners went by special train on a pilgrimage to St Winifred’s Well at Holywell in North Wales. It is not known whether this was a regular event, but it does show a continued attachment to older ‘English’ commitments in the face of continental or Roman ones. There are no reported pilgrimages to Lourdes before the Great War. Practices in Stafford certainly became more demonstrative after the Great War. In the early 1920s the new priest at St Patrick’s, Fr Daniel Kelly, introduced the office of Tenebrae during Holy Week and the Quarant’ Ore or Forty Hours Prayer. In 1923 the first public Catholic processions took place in the town since the Reformation with a procession in honour of Our Lady in May followed later by a Corpus Christi procession. These events were widely seen as showing the Church’s self-confidence and its acceptance in the life of the town. 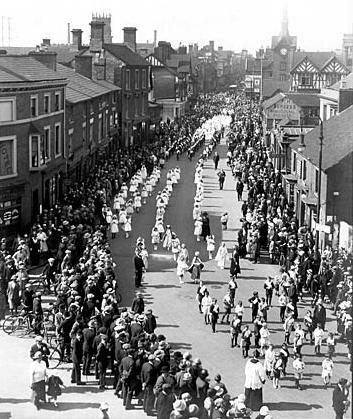 Procession in honour of Our Lady, Bridge Street, Stafford, May 1923. Catholic Sunday Schools were operating by 1887. The Brothers of the St Vincent de Paul were also dealing with poverty amongst the working class through this period, although it is not known how many were actively involved. In the early 1880s the Catholic Club was opened in Broad Street ‘to provide a social centre for the Catholic men of the area’ and as a counterweight to the pubs. In 1884 the establishment of the St Patrick’s Young Men’s Association backed up the new Church presence in the north end. One of those involved was Bartholomew Corcoran from Castlerea, Co. Roscommon (see my post on 28 July 2015). He worked hard to become a man of influence and respectability within Stafford’s Catholic community and in the wider society. In 1896 St Patrick’s Day was celebrated in some style at St Patrick’s. Fr. O’Hanlon presided over a lecture on ‘The Young Ireland Movement’ that dealt with the history of Ireland from the time of the Union to the founding of The Nation newspaper. It discussed ‘the aims of the Young Ireland party and showed the application of their doctrines to the present day’. Bartholomew Corcoran was there to propose ‘a hearty vote of thanks’. The evening was rounded off by a concert of romantic Irish songs performed by various members of the congregation, but only three performers in fact came from Irish families. The rest were native Staffordian Catholics. The inclusion of a lecture on Irish political history shows that some people had an interest and possible identification with Ireland that went beyond sentimental songs. It is, however, the only recorded instance of such a thing sponsored by the Catholic Church in Stafford. In his career as a town councillor Corcoran dealt only with parish pump issues and even avoided involvement in education affairs because ‘he didn’t want squabble but amicable work’. Corcoran’s family history was always aimed towards integrating – some might say ingratiating – himself into respectable Stafford society. During the 1900s Catholic social activity extended to sport. In 1906 a Stafford Catholic United FC played in the local league and, more significantly, there is mention of a Stafford Celtic club in 1908. These clubs don’t seem to have survived long and Irish Catholic involvement in local sport was mostly in the secular clubs. Youth work by the church did continue with the foundation of the Catholic Boys’ Brigade linked to St Austin’s; it was operating by 1911. In the Inter-War period the 8th Stafford Scout troop and 20th Stafford Girl Guides were established at St Patrick’s and they became an important social focus for Catholic children in the north end. 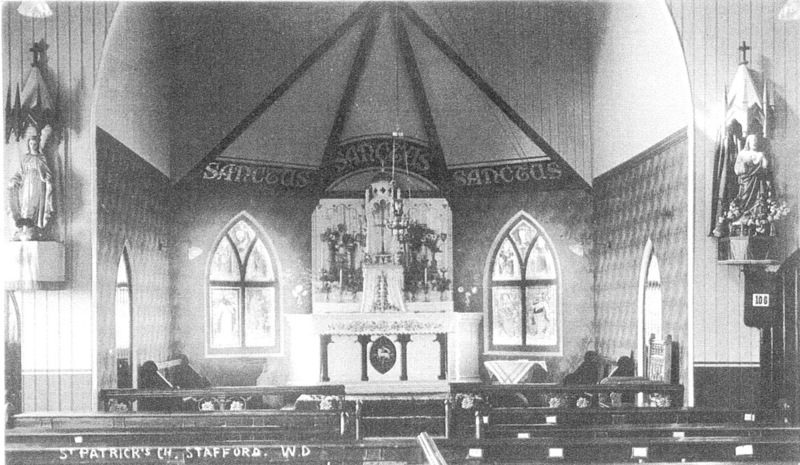 The Catholic Churches developed, therefore, a network of social and religious activities that tried to build adherence to the faith and develop a Catholic community identity, particularly in Stafford’s north end. Irish and Irish-related people took part in these activities, but hard evidence of the precisely who was involved is only available spasmodically. It is clear, nevertheless, that the Stafford churches had a composite English-Irish congregation and one that was increasingly intermixed through social activities and marriage connections. Catholic religious affairs in Stafford cannot be used as a proxy for Irish social and religious affairs. The key issues are to what extent Irish involvement in these affairs reflected, but also influenced, their own evolving identity and, conversely, to what extent the Irish may have influenced the character of the town’s Catholic religious and social institutions. I shall look some aspects of this in the next post. See John Herson, Divergent Paths: Family Histories of Irish Emigrants in Britain, 1820-1920, (Manchester, Manchester UP, 2015) pp. 287-291 for a fuller study of O’Hanlon’s work and life. The nearest he came was a magic lantern show, ‘A Tour of Ireland’, with ‘views of the scenery and humorous anecdotes’ which perhaps suggests a willingness to crack ‘paddy’ jokes. Staffordshire Advertiser (SA), 27 November 1886. M.W. Greenslade, St Austin’s, Stafford, 1791-1991, (Birmingham, Archdiocese of Birmingham Historical Commission, 1991), p. 17. P.E. Donnelly, St Patrick’s, Stafford, 1895-1945: Recollections of a Parishioner, (Stafford, 1945), unnumbered but pp. 1-5; the history formed part of a Souvenir of the Golden Jubilee of St Patrick’s, Stafford and Donnelly’s authorship is only obliquely stated in a postscript by the parish priest. Analysis of 1901 census returns for Irish-born and Irish-related males. SA, 25 March and 1 April 1882. SA, 6 April 1889; 7 December 1895. SA, 17 July 1886. The pilgrimage was reported because four people were injured in a road accident at Holywell. Two of them were Flora McDonald and her granddaughter from a Irish middle class Tory family. Donnelly, pp. 4-5. There is a photo in Greenslade 1991, p. 24. M.W. Greenslade, St Austin’s, Stafford: a History of the Catholic Church in Stafford since the Reformation, (Stafford, W.H. Smith and Son Ltd., 1962), p. 25. SA, 21 September 1906 and 15 August 1908. SA, 4 February 1911. One interviewee in 2003 remembered the Catholic Boys’ Brigade as unfriendly during the 1940s and he saw it as part of a wider hostility to poor children at St Austin’s School. He joined the Baptist Boys’ Brigade – ‘very welcoming’ – and lapsed from the Catholic Church. Reminiscences of Roy Mitchell, Daniel Ryan, Sheila Bayliffe and Peter Godwin, 2002-3.